Day after storm clean up. BOY, DOES OUR backyard look naked. 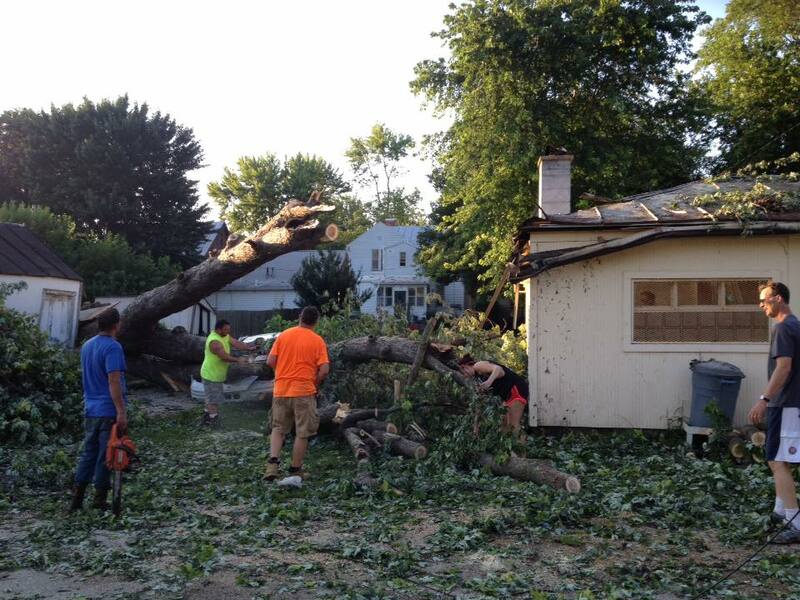 You might remember the July 13 storm which blew down about half of Quincy. It knocked down a massive maple tree in the very back of our property, and it took our garage and shed right off the foundations. Sheryl dealt with the insurance folks and fortunately we were covered. So we're getting a new garage by the back alley, where the old garage sat. All three structures are a little crooked. The guys doing the work started yesterday morning, and the garage was basically flattened by the time we left for the store. It was strange to come home at noon and then after work to see nothing there. Even the 6 foot remainder of the tree was gone from the site. You get used to things being around. When they are gone, everything just seems a little bit off kilter. We soldier on until things get replaced or back to normal. The men doing the job are busting their butts in very warm weather, even when we discovered the concrete pad had to be replaced, too. Same with the back sidewalk. 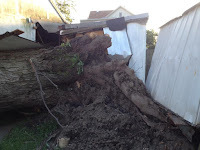 Both sections of concrete had been lifted out of the ground by the massive trunk of the tree. 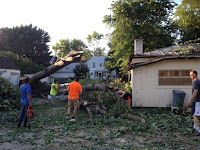 Until the rest of the maple was removed yesterday, it was tough to see the total damage. The concrete is being poured this morning and the new garage itself should be going up soon. I'll be glad to have it back - our car should fit into it a little bit better, and all the stuff in the backyard can go back inside. The shed is also being replaced and will hopefully be up within a week or so, too. When the storm hits, you weather it, and you rebuild. It takes time and it's not always easy. It's how you deal with it that counts. You build more patience and flexibility, and you get stronger for the next storm. And soon we'll get used to looking out the back door and seeing our new garage and shed. No garage, no shed, no 100-year-old maple tree. Just a cracked foundation and concrete pad. Labels: concrete, garages, sheds, sidewalks, storm damage.